Saks 5th Avenue clothing for thrift store prices! RUN to Off5th NOW! I happened to notice something about pink dots at Saks off 5th at one of my online groups and I decided to finally check it out. I can't believe nobody clued me in about this deal earlier because the sales people told me it's been going on for weeks. The promotion started at $19.99 for all pink dot clearance but just dropped to $14.99. I probably would have been thrilled at the higher pricepoint (and better selection) but I did pretty well considering. This promotion is clothing only (no shoes) but they did have a few pieces of costume jewelry for $10 in the accessories department. I made a beeline to the dresses and got started there. When digging thru the racks (check all sale racks as pink dots are mixed in) I found a $2000+ blue Pucci dress and almost had a heart attack. It needed some repair (half the seams were open and the zipper was broken) but for $15 it was a no-brainer. Unfortunately at the register it did not scan for the promotional price because some very evil person with a sick sense of humor stuck a pink dot where it didn't belong. The manager wouldn't honor the pink sticker because it was too expensive of a dress. That dress was wrecked. I'm sorry but even at half off nobody was gonna buy that dress in that condition. That's usually my problem with the Saks outlet (and why I don't shop there regularly) - they price things based on labels without any consideration for the crappy condition of most of their clearance items. Remember the Louboutin purse that I posted a while back that looked like a dog chewed on it - that they priced at over $1000? When they have sales like this I don't mind buying damaged goods but otherwise they should not be selling torn dresses for $250. Boo. This graphic sweater caught my eye. Cute but NMS. All the other clearance clothing was 50% off. 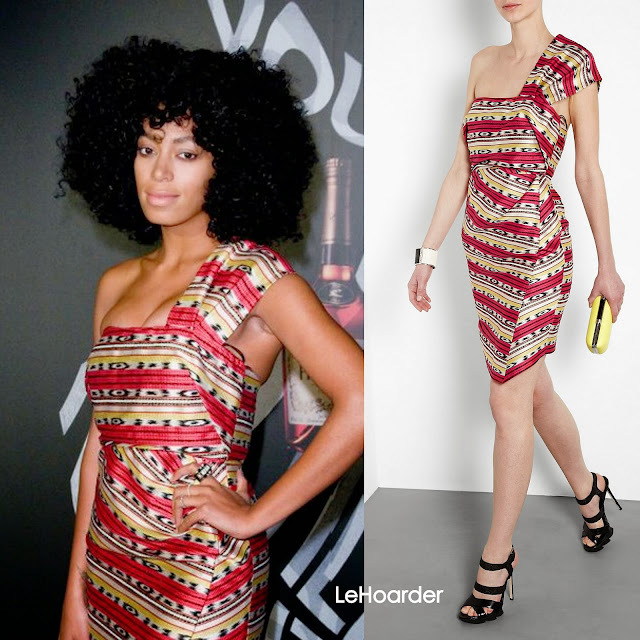 I saw this Vince leather dress that I just got for a penny and laughed at their $671.99 (less 50%) price. Ha! This Charlotte Ronson silk dress was re-tagged so I don't know the original retail. Shows a little wear but for $15 I'll deal. It's super short but makes me look skinny (always a win). I figure as long as I don't bend over I'm good. Most of the clearance items were from Saks private label lines but a few pieces were worth it. This knit sweater dress was so cute - I got a S for me and an XS for my nieces. Vera Wang, baby! I know I need another black dress like a hole in the head but the details were sweet...and again, $15. Enough said. Another Saks label knit dress. Very Missoni and I love the longer length. I wish they had a XS because some of the knit pieces were pretty stretched out from literally hanging around for so long. I actually found two DVF dresses but the other is already with my tailor. 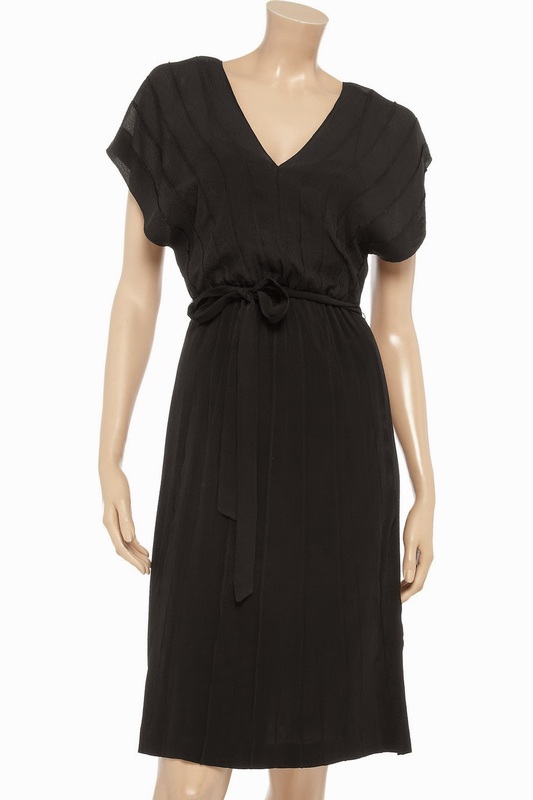 The size is missing (as is the belt) on this $425 Malena dress, but the paper tag says 0. I can get it on so I'm guessing it's more like a 2. Saving for 10 lbs from now. This LaVia18 sweater dress doesn't do much for me (and is badly stretched at the shoulders) but I couldn't leave a $448 dress behind. I'm gonna play with it (maybe belt it?) and see if it's worth keeping. Last but not least is this $200 tiered Adrianna Papell dress. I love the color but not sure what I would do with it. I thought it was funny when I spotted this table of Phillip Lim and Chloe bags - as they both had sample sales this week. Prices were pretty decent compared to the sales. I only saw the CASH pouches at the sale but if they had this bag version it would have been $200. Saks price was $234.99. I saw this bag in Snakeskin at the sale for $200 but it was missing a scale in the front and it drove me nuts. Get the black and white version for $289.99 at Saks. Not great considering the one I saw had a higher retail due to the skin. Chole bag for $966.99 - pretty similar to the sample sale too. I also spotted a table of Prada (it's been a while) - nothing too exciting. I just figured you'd like to see pricing. The small makeup bags were $129.99 and prices topped out at $749.99 for the larger nylon totes. If you haven't been to the Saks outlet in a while, now would be the time! H&M also has several weekend deals worth checking out. In addition to pretty full sales racks I spotted lots of pieces starting at $2.95 (not in my size of course...) and buy a bikini top and get a bottom free. The tag doesn't have to have a pink dot to be 14.99. The clearance tag just needs to end in .97. Then it's the pink dot price. I live in NYC but am down in FL for the weekend. They are much more free with the info down there. The woman working I the dressing room told me just to go back and look for tags ending in .97 and she was most certainly correct. And there were TONS. Good luck if you go back! It's true - they are not so helpful here. I was there earlier today too...wish I noticed your comment earlier. I think I'm done shopping for the day. Would love to check out Bloomies but I don't think I have the stomach to brave Sawgrass Mills . Found lots of Vince at Off 5th with the .97 tags so that will have to hold me over!